Steel box profile for Sheds or Garages? Should I have a Steel Box Profile Roof on my Shed? If your Shed is Pent or Apex with a depth over 4mtrs then, yes. Felt isn’t enough to keep the rain out. 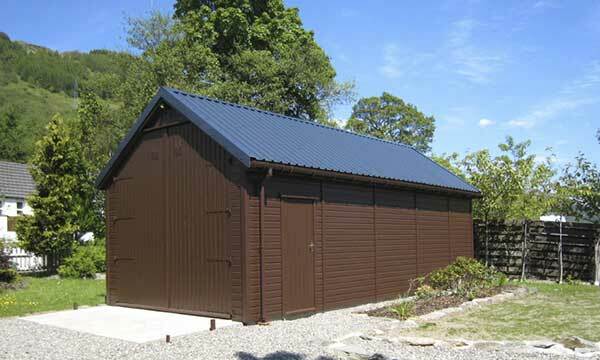 Steel box profile is our swear-by answer to big roofs and low pitches. What is a Steel Box Profile Roof? The type of Steel Roof we use is Permaroof, from Planwell in Morrayshire. They offer 3 types of Steel Roofing and we tend to stick with the Nova, unless otherwise requested. The 0.5 Nova (painted finish – 20-year guarantee) is what we choose to cover Shed/Garage roofs that either exceed 4m in depth or have a pitch below 20 degrees. Why do you need a steel roof? What’s wrong with felt? On our Apex buildings which have a 27-degree pitch, there is nothing wrong with felt, it works incredibly well. However, as the length exceeds 4m we believe the rigidity of the felt is no longer capable of carrying its weight, making it susceptible to sagging, which in turn leads to leaking joins. In 2013 we experienced a high volume of feedback relating to Pent sheds leaking and a fair few big builds too. This was an incredibly testing time for us we were continually snagging, sealing and re-felting. Our persistence was futile! A shed pandemic! We had no option but to ditch the felt and find an alternative. We had used Steel Box Profile on our bigger projects for years, we knew that because of its; proven track record, 20-year guarantee and a 40-year life expectancy, it wouldn’t let us down. Steel cannot ingress water, no matter how long the rain batters on. What about condensation, Steel is bad for that surely? It’s not just Steel you know… We still use our sarking boards (roof cladding; tongue and groove boards which face in the interior of your Shed). The Steel is battened on top of the sarking and this provides a cavity allowing any moisture build-up to be ventilated. Not only that we wash our buildings internally with an Anti-Fungi treatment to ensure they are protected from persistent damp conditions. Is a Steel Roof really what I’m looking for? It depends on your own preference of how you want your building to look. If your building is a Summerhouse or Cabin, Steel might not be for you as it’s sometimes seen as quite an ‘industrial’ roofing option. Ideal for Garages and Workshops but maybe not aesthetically pleasing for other builds. An alternative to Steel, in this case, would be Shingles. We use Bitumen Shingles which can be used on pitches as low as 15 degrees. Not Ideal for a Pent style, but definitely a comparable option for large Apex styles when looking for a little more… Finesse!